Score0-1 - Moderate to Large: Population size is imprecisely known but is believed to be >10,000 individuals. 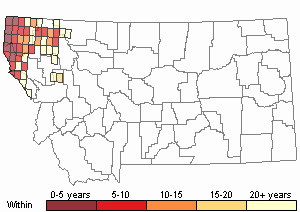 Score1 - Peripheral, Disjunct or Sporadic Distribution in MT: Widespread species that is peripheral, disjunct or sporadically distributed within MT such that it occurs in <5% of the state (<7,500 sq. 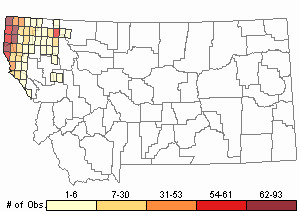 miles or the combined area of Beaverhead and Ravalli Counties) or is restricted to 4-5 sub-basins. Score0-1 - Moderate to High. Occurs in >10 Subwatersheds (6th Code HUC’s), though the species' distribution is not sufficiently documented to place it within one class. Score0 - Stable or Increasing: Population size, range, and/or available habitat stable, increasing or fluctuating in the recent past (approximately 30 years). Score0 - Low: Impacts, if any, to the species are expected to be minor or insignificant (affecting <10% of populations) in severity, scope and immediacy. Score0 - Low Vulnerability: Species does not have any unusual or specific life history or biological attributes or limted reproductive potential which makes it susceptible to extirpation from stochastic events or other adverse impacts to its habitat and thus slow to recover. Score 2 to 4 total points scored out of a possible 19. Medium-size trees to 60 m tall with a narrow crown and drooping leader. Bark brown, thin, scaly. Leaves flattened, shiny yellow-green above with broad, white stomatal bands below, 8–15 mm long, borne in a single plane or nearly so. Seed cones green to brown with age, narrowly ellipsoid, 15–30 mm long. Scales oblong-ovoid (Lesica 2012. Manual of Montana Vascular Plants. BRIT Press. Fort Worth, TX). In MT in Lincoln, Flathead, Sanders, Lake, Mineral and Missoula counties; AK to CA, ID, MT (Lesica 2012. Manual of Montana Vascular Plants. BRIT Press. Fort Worth, TX). 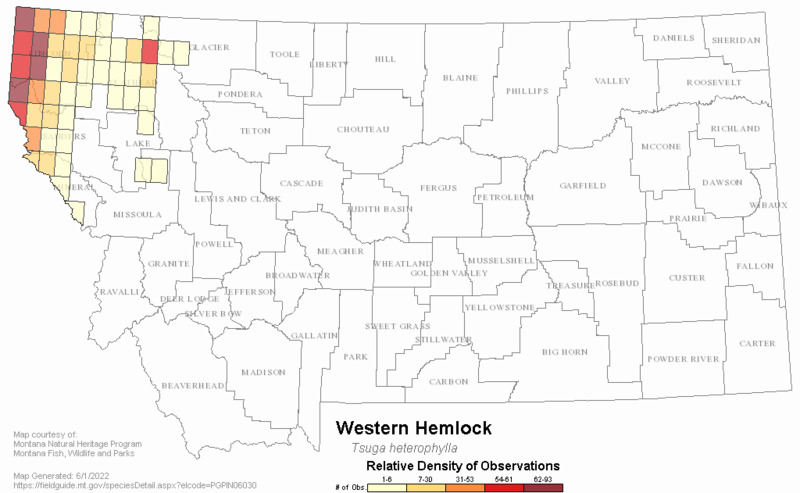 Mesic to wet forests; valleys to montane; collected in Flathead and Lake counties (Lesica 2012. Manual of Montana Vascular Plants. BRIT Press. Fort Worth, TX). 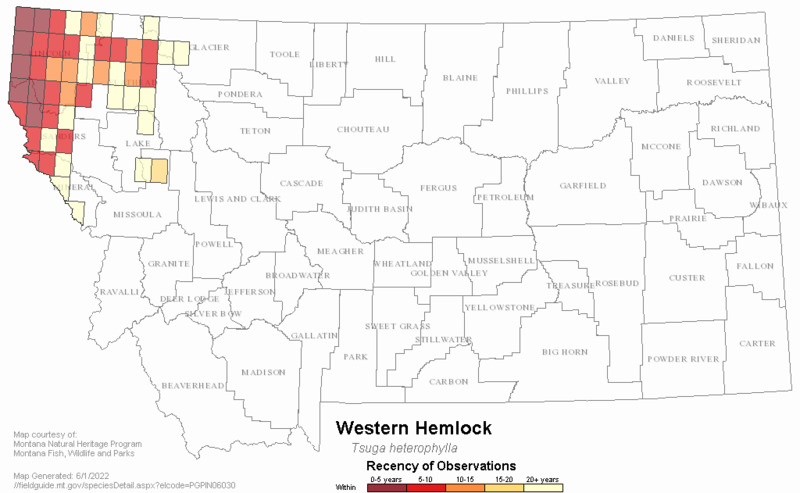 Web Search Engines for Articles on "Western Hemlock"